Figuring out the best venues and vendors. Managing the finances and logistics. Being yelled at in front of everyone while maintaining a sincere smile. This job seems planned just for you! You’re confident you can plan and execute an event once you get the job, but how do you prove it to them? You simply need a great event planning resume. And, with just a bit of time, dedication, and this guide, you’ll soon be talking about that resume at the interview for a great event job. Event planner resume examples better than 9 out of 10 other resumes. How to write an event coordinator resume that will land you more interviews. Tips and examples of how to put skills and achievements on an event manager resume. How to describe your experience on a resume to get any event planning jobs you want. Here’s an event planner resume sample made using our resume builder. Event Planning Resume Example—See 20+ resume templates and create your resume here. Trade Trifles & Trivia: What is event planning? Is there a difference between that and an event coordinator or event manager? An event planner generally makes all the decisions, arrangements, and logistical preparations in advance. Event coordinators typically carry out the plan and make it realized. Event managers are usually those who work for the venue, making sure clients’ events go off without a hitch. These terms are often interchanged, so it is best to check the job description in detail. What’s the Best Format for an Event Planner Resume? I’m gonna start you off with some bad news: the employer at the event management agency won’t read your whole resume at first. In fact, they’ll take a mere 6 seconds to scan it. Like a wedding MC speaking to people of ever-decreasing attention spans, you need to catch their attention. You need todo it quickly. And you need to not let go. That’s why you must choose the best format when writing a resume. Got experience working in event production or event management jobs? You’ve got it made. Use the chronological format for your resume. This format emphasizes your planning duties, work experience, and management work history. List your most recent positions first, and go back through past jobs in reverse-chronological order from there. 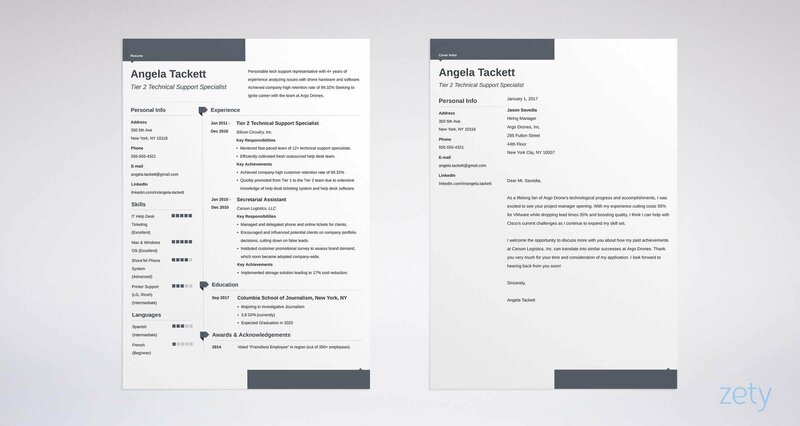 Pro Tip: Make good use of white space, eye-friendly headings, and clear, the best resume fonts. But, what if you need an entry-level event planner resume? Don’t worry, because here’s the thing: you might not have experience for this job, but you have experience relevant to the job. On a first-time job resume, you’ll still list other work you’ve had in reverse-chronological order. However, this time you won’t just talk about your professional coordinating duties and planning responsibilities. Instead, you’ll highlight relevant skills and achievements from past jobs in the neatly-aligned bullet points. Pick and choose transferable skills to match the event coordinator job description from the ad. Have no work experience at all? Not to worry! Instead, the education section moves to the top, followed by other sections (e.g., volunteering, languages), which we’ll talk about more in just a moment. 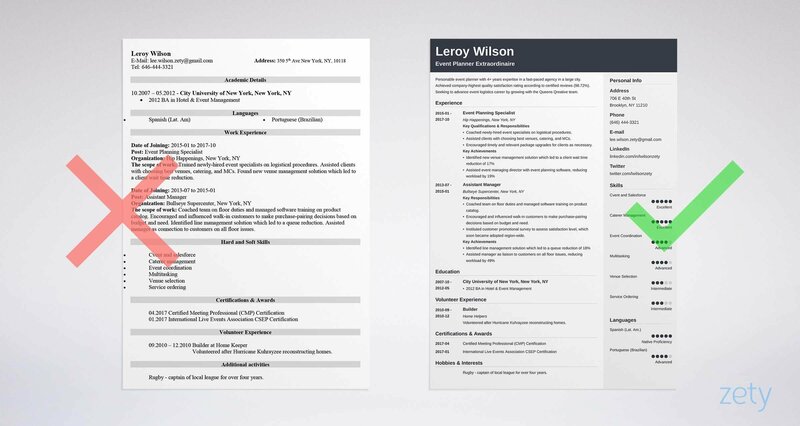 Then, save your draft resume as a PDF, as this format keeps the layout in shape. Pro Tip: Check the job posting to make sure PDFs are OK. Some Applicant Tracking Systems (ATS) get jammed like a narrow emergency exit on PDF formatting. The ATS scans for resume keywords; if it can’t read your file, it’ll assume you can’t do anything right. Not entirely sure about the reverse-chronological format for your party coordinator resume? See our guide: The Best Resume Formats: Which One to Choose for Your Job? Event Planner Resume Summary or Resume Objective? You want to catch the agency director’s eye like you’re the main event. To do that, you need a resume objective or resume summary. Let’s go over these two now, and you’ll be able to pick the best one to appeal to any hiring manager of event coordinator jobs. It highlights your related event planning work history. It promotes you with a previous proud achievement. 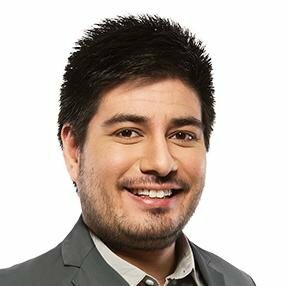 Personable event planner with 4+ years expertise in a fast-paced agency in a large city. Achieved company-highest quality satisfaction rating according to certified reviews (98.72%). Seeking to advance event logistics career by growing with the Queens Qreative team. I have been an event planner for the last 4 years. In addition to my knowledge of various planning duties, I also handle finances, logistics, venue booking, and key administration procedures. See the differences? While the Wrong one has some impressive experience listed, it plays up your general event planning duties as if they’re accomplishments, which they aren’t. In the Right example, you give evidence of your event planning skills, achievements, and experience. Pro Tip: Personalize your event planner resume example by dropping the agency’s name into your resume summary or objective. It highlights planning skills and qualities. Diligent assistant manager with 3+ years experience with large retail store. Obtained highest grades in client satisfaction (100%) and return mitigation (98.3%). Seeking to utilize transferable skills to switch careers by growing with the Queens Qreative team as the new event planner. I am an assistant manager eager to become an event planner. I don’t have experience in event coordination, but coworkers often say that I am a quick learner. I am very motivated because I enjoy being in changing environments for work rather than behind the same desk every day. See the differences here? Queens Qreative is taking a bigger chance by hiring someone without exact experience— in this case, an assistant manager for the event planning role. You’ll need to show them that you have what it takes. In the Right one, we used some transferable skills from the retail store and some proud achievements for a quantifiable win. The Wrong one doesn’t show enough to hold the hiring manager’s attention. That’s not only what you’d like guests and clients to say after their hangovers fade away—it’s also the reaction you want from the agency director after they conclude your interview. If you’ve held one or more event planning jobs before, you’ve got a head start. Still, include only the best responsibilities that match the agency’s interests. Coached newly-hired event specialists on logistical procedures. Assisted clients with choosing best venues, catering, and MCs. Encouraged timely and relevant package upgrades for clients as necessary. Helped clients with venue selection. See the differences? The Wrong example feels incomplete and general, and the items listed were your everyday agency responsibilities. In the Right example, however, we itemized your duties in more detail, and then included event planning achievement(s) with quantifiable numbers for the win. Never worked an event before? No problem. We just need to show them that you’re the headlining act. Coached team on floor duties and managed software training on product catalog. Encouraged and influenced walk-in customers to make purchase-pairing decisions based on budget and need. Instituted customer promotional survey to assess satisfaction level, which soon became adopted region-wide. At first, being an assistant manager doesn’t seem too similar to a job in event planning. But, we played up those duties and achievements which translate well for a resume in event management. Pro Tip: Take some time to think about your past jobs. Which areas relate best to having strong event planning skills and techniques? Pick those for your resume for event planners. Is Your Education Section Underperforming? It Might Be. The education section—a waste of space, like a venue without a properly planned table arrangement, right? You’d better think again. The education section is a valuable part of the perfect resume for event planning positions. In the case of those without relevant experience, the education section becomes the most important. So, how to format your resume’s education section? Pro Tip: On your event specialist resume, when applicable, only include your GPA if it is as close to 4.0 as possible. Too low will hurt instead of help! Two things make an event agency director sit right up with a grin: a flawless event conclusion and a great event planning resume. Let’s audit the skills section and include only the perfect ones in yours. Skills on your resume for event management are important, but just the right ones. Also, not too many and not too few. First, make a list of some generic hard and soft skills. Hard skills are specific abilities and know-how (e.g., Event Manager 5.2 Software). Soft skills are self-developed, life-learned attributes (e.g., people skills, adaptability). However! These are good skills for a resume—for average event planner resume examples. But you’re not average, so don’t let your event resume be average, either. To make your resume unique, it’s time to browse the job listing and underline resume keywords that match their needs. Pro Tip: Type a bunch of your relevant skills into an Excel column, with a number (1-10) of importance and relevance in the next column. Then, filter the worst ones down until you have the best 5 or 6. Notice the differences between the two? In the second one, your laziness is obvious—you just googled “event coordinator skills” and stuck the results in. In the first one, you look like just planner they’ve been searching for. You’ve got your address on the resume. Experience, education, skills—check. You have all the standard items, but it’s missing your secret ingredient: extra resume sections. Extra sections make resumes for event planning more unique. Everybody puts their name, experience, and skills. This is where you’ll list relevant things that you’re proud of to really stand out. Volunteered after the Tiguan Island Tsunami reconstructing homes. See what’s wrong here? You have every right to be proud of these accomplishments, but they’re just not relevant for event coordinator jobs. But which ones are right? Let’s go over some of the most popular additional sections for your resume now, along with some better, more relevant examples. Volunteered as a shift supervisor at a state nursing home. This one is more relevant to event management positions, as the supervisory position is more relatable to the management of events. Also, if you are writing a resume without experience, well, now you have experience! Rugby—captain of local team for three years. Group sports show that you function well on a team, an important trait for event agencies who need fast-paced teamwork and the ability to handle many small, moving parts. Earned a cert for Citrix Certified Expert – Virtualization? Certified Meeting Professional (CMP) Certification. International Live Events Association CSEP Certification. Global Business Travel Association GTP Certification. National Association for Catering and Events CPCE Certification. American Marketing Association Professional Certified Marketer (PCM). Know another language? That could be very helpful on an event managing resume, and maybe a necessity, especially abroad or in locales where English isn’t the first language. Knowing another language can only help. Advanced proficiency in Spanish (Latin American) language. How About an Event Coordinator Cover Letter? Is a cover letter even necessary? Even if the job ad says, “cover letter optional”? Well, it is if you want the job. A resume without its event coordinating cover letter is not ready to turn in, and here’s why: 45% of recruiters say they will reject a resume without a cover letter. So, obviously you need an event planner resume cover letter, but what to include on the cover letter? Explain why this particular event agency excites you. Drop names—name the hiring manager and agency to personalize it. Mention something about the creative agency that you relate to on a personal level. Be witty, charming, and clever. Positively grab their attention—it will mean more than the degrees and certifications you listed in your event planner resume template. Pro Tip: Research the agency online and mention something in particular that stands out to you. This is something a resume can’t include and will really catch their eye! Whether you’re a career event planner or pursuing a party planner internship, if you’ve followed the plan in this guide, you should have a resume that’s sure to get you an interview. Personalize, Personalize, Personalize. The agency will be accepting dozens of applications. Address them by name in your cover letter. Mention the company in the heading. Make yours stand out. You want to join them, so make them need you. You’re eager to take this event coordinator job, so be all in. Spice it up with action verbs and impressive achievements to wow them. Paint the best picture of yourself and the quality of work you do. Double- and triple-check. Spend an extra few minutes making sure that your resume and cover letter are up to par. Did they ask you to include a particular phrase in the email subject line? Are your email and cover letter addressed to the right manager or partner? You now should have a great resume for event planner jobs that’s ready to be sent to even the most discerning of hiring managers. Time to attach the final cover letter and resume to an email and send it off. Do you have any questions on how to write an event planner resume? Not sure how to describe your event coordinator skills or achievements? Give us a shout in the comments below and we will answer your question. Thanks for reading!